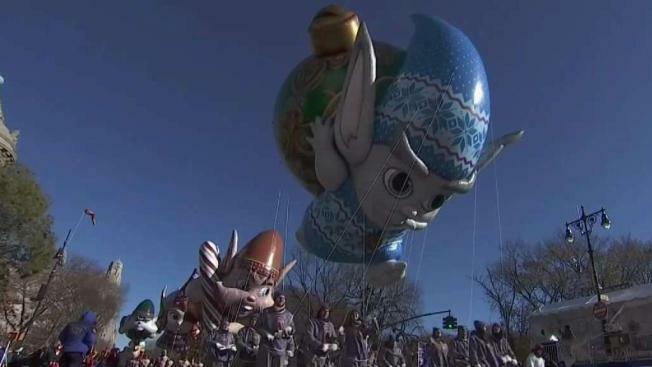 Frigid weather and blustery winds didn't chill the enthusiasm at the Macy's Thanksgiving Day Parade, where spectators bundled up in blankets and sleeping bags and the giant character balloons flew lower than usual. SpongeBob, Charlie Brown, the Grinch and other big balloons were cleared for takeoff just before Thursday's parade, although some floated at noticeably lower-than-usual heights above the people holding their tethers, like the outstretched hand of the "Diary of a Wimpy Kid" balloon that appeared to hit some of his handlers on their wool cap-covered heads. The 21 degrees (minus 6 Celsius) at the start made it one of the coldest Thanksgivings in the city in decades, and the temperature warmed only a few degrees as the parade rolled along. Officials had been ready to order the 16 helium-filled balloons to a lower altitude or removed entirely if sustained winds exceeded 23 mph (37 kph) and gusts exceeded 34 mph (54 kph). There have been mishaps and injuries in the past when gusts blew them off course. Tony Stout had camped out with his extended family since 2 a.m. to make sure they got a good view of his son, who was in the parade with the Ohio State University marching band. "Ohhh, I'm freezing and numb, but excited," said Stout, who had traveled from Columbus, Ohio. Dylan Mahoney, who has come to the parade every year for the past dozen years, said he stayed warm by layering, including several pairs of socks. "It's one of the coldest," he said, but "we've watched in the rain before." He said he loves the tradition of attending the parade, driving from Leonia, New Jersey, in the early hours to see the bands and balloons and racing for a good spot. Entertainers including Diana Ross, John Legend, Martina McBride and the Muppets from "Sesame Street" performed in the frigid cold. Macy's later apologized for "technical difficulties" after viewers ripped into singer Rita Ora for what they saw as awkward lip-syncing. The British artist appeared out of sync with the vocals that viewers heard during parts of her televised performance of "Let You Love Me," and the episode sparked a flurry of online commentary. Macy's apologized via Twitter, saying "several recording artists experienced technical difficulties that negatively impacted their performance" and were beyond the performers' control. In another moment that got attention, a performance from the Broadway musical "The Prom" included a kiss between two female cast members. The producers told Entertainment Weekly it was the parade's "first LGBTQ kiss." Thursday was one of New York City's coldest Thanksgivings, with National Weather Service data showing the temperature peaked at 27 degrees. The coldest on record was in 1871, when the warmest it got was 22 degrees. 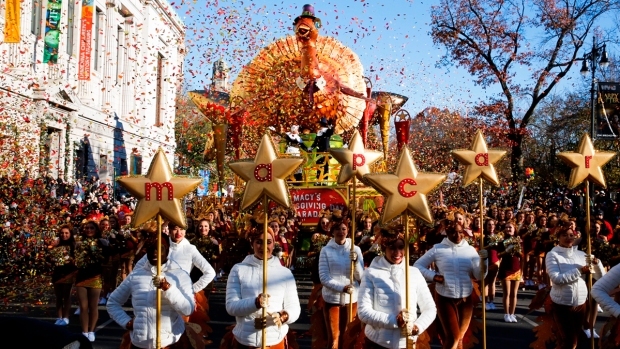 The event features about 8,000 marchers, including high school bands from across the country, and two dozen floats, culminating with the arrival of Santa Claus.